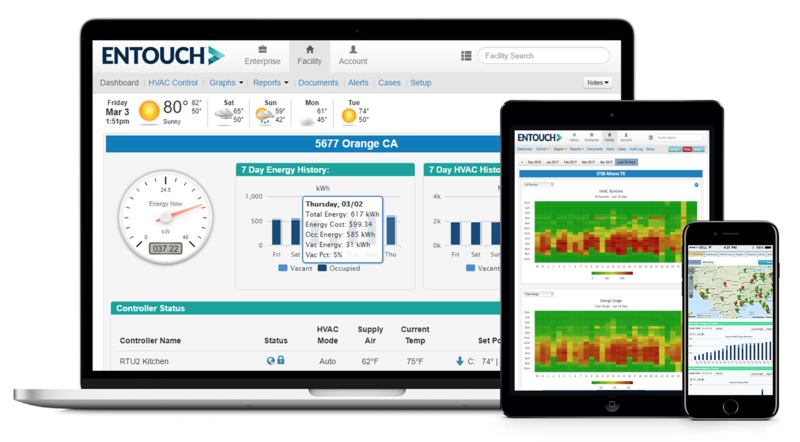 ENTOUCH provides plug and play capability, allowing you flexibility to install our IoT sensors and controls at your pace to align with your corporate budget and facility strategy. With our Edge technology, you can retrofit, connect and streamline your existing systems on the ENTOUCH gateway for immediate monitoring of incumbent data, reducing the pressure and pains of a total rip and replace. We give you the scalability to implement our IoT sensors and controls as your legacy systems are phased out, hit end of life and your budget allows. ENTOUCH.360 gives you the ability to deploy at a rapid pace for immediate realization of costs to benefits. Our seasoned technicians and network of certified third party service providers simply access our mobile application for quick and easy configuration at their fingertips. With our cloud-based commissioning tool, our technicians can configure and activate each controller in your facility by simply identifying the master controller and unique passcode for all secondary devices. The master controller acts as the gateway to streamline data from all other devices. Once activated, configuration for each unique device occurs in the cloud without human intervention. ENTOUCH.360 gives you the ability to deploy at a rapid pace for immediate realization of costs to benefits. Our seasoned technicians and network of certified third party service providers simply access our mobile application for quick and easy configuration at their fingertips. With our cloud-based commissioning tool, our technicians can configure and activate each controller in your facility by simply identifying the master controller and unique passcode for all secondary devices. The master controller acts as the gateway to streamline data from all other devices. Once activated, configuration for each unique device occurs in the cloud without human intervention. ENTOUCH provides expert advisory services and 24/7 customer support for closed loop facility management. Our dedicated team of Account Managers are constantly monitoring your facilities to alert you when data inconsistencies arise such as spikes in energy consumption or maintenance malfunctions. We help pinpoint operational deficiencies and equipment issues to improve your business processes and reduce costly third party maintenance intervention. We become an extension of your team, as expert advisors tasked with building the most lucrative energy management strategy giving you quarterly updates on performance with analytics and insights to improve your operating model paired with 24/7 access to our customer support team.